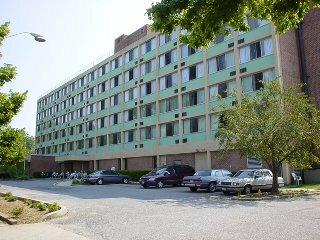 The Saints Cosmas and Damian Adult Home, sponsored by the Orthodox Church in America and licensed by the Department of Health of the state of New York, is an aged care facility with a six-story, 270-bed building located on a 3.5 acre site in the residential section of Staten Island. Centrally located, the Ss. Cosmas and Damian Home is easily accessible by private and public transport. The Home is committed to providing cost-effective ways of maintaining the independance of the elderly, providing a variety of social and cultural activities. Residents at the home are able to walk (sometimes with assistance) and can take care of themselves, but the Home does provide regular medical care should residents require. Each room is fully furnished, with telephones, private bath and wall-to-wall carpeting. Many of the residents are bilingual, speaking English, as well as Russian, Italian, Spanish, Polish, and Greek between them. Liturgical services are held regularly in the chapel by Orthodox clergy, and are also held regularly in the building by Roman Catholic clergy. After his retirement from public service, Metropolitan Ireney of All-America and Canada lived and reposed in this facility. This page was last edited on August 3, 2011, at 16:16.